Former No.3 Carlton Fire Station is a symmetrically composed three storey brick and stucco fire station building designed by architect Cedric Ballantyne in 1928. A building permit was issued in June 1928 for a building cost of 35,000 pounds. The building has a central entrance leading to a courtyard flanked by accommodation blocks and vehicle garages. Former No.3 Carlton Fire Station contained accommodation for single and married men on the first and second storeys and the ground floor to Swanston Street was let for commercial purposes. The central and end pavilions are constructed of face red brick. They are linked by slightly recessed wings composed of three bays divided by stuccoed brick piers. The trabeated system with abstracted columns and pilasters gives a stripped classical stylistic effect. The parapet is balustraded. Former No.3 Carlton Fire Station is of architectural and historical significance to the State of Victoria. Former No.3 Carlton Fire Station is architecturally significant as the second largest fire station in Melbourne after Eastern Hill and as the largest fire station design of the prolific architect of Melbourne Fire Brigade stations, C H Ballantyne. The station is functionally similar to other Ballantyne station designs, incorporating garages, accommodation, recreation rooms and offices, but it is stylistically unusual. The stripped classicism of former No.3 Carlton Fire Station is in contrast to many suburban stations of the 1920s such as Essendon, Ringwood, Oakleigh and Coburg that were characteristically domestic in appearance. 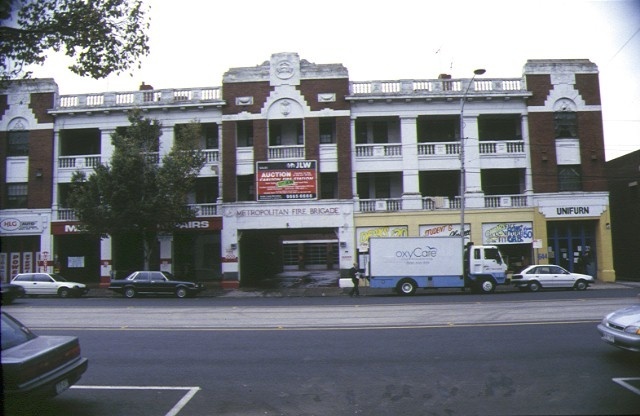 Former No.3 Carlton Fire Station is historically significant for demonstrating a peak in the development of the Metropolitan Fire Brigade after the implementation of the Fire Brigades Act of 1890. The Act gave the Metropolitan Fire Brigade Board the ability to form fire fighting units, to train and house firemen, and to accommodate them and their fire vehicles in specially designed buildings. The intact survival of this station demonstrates this integration of work and accommodation for the fire-fighter. 1. 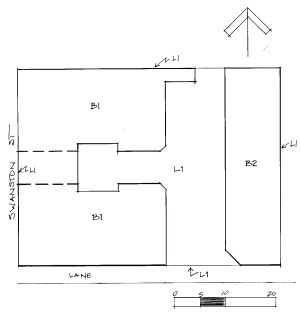 All the apartment block building marked B1 apartment blocks and B2 engine house, on Diagram 604556 held by the Executive Director. 2. All the land marked L1 on Diagram 604556 held by the Executive Director, being all the land described in Certificate of Title Vol. 3321, Folio 153. Prior to the passing of The Fire Brigades Act in December 1890, Melbourne was served by a system of volunteer and private fire brigades such as those owned and operated by Carlton Brewery and the Yarraville Sugar Refinery . The Act established a brigade to cover all of Victoria. The Metropolitan Fire Brigade Board (MFB) equally represented the state government, insurance companies and municipal authorities, financed by equal shares. The first schedule of the Fire Brigades Act 1890 stipulated the need for the formulation of a metropolitan district fire brigade and nine country fire districts for the state of Victoria. .....purchase, take on lease or otherwise acquire stations for engines, stable houses for firemen and such other buildings or land and all such engines, escapes and other apparatus and plant and other property as such Board may think requisite for carrying into effect the purposes of this Act, and may from time to time sell or exchange or let and property acquired by or vested in by them for the purpose of this Act. The Boards were also responsible for the formation of permanent or volunteer brigades, the acquisition and disposal of equipment and the establishment of training programs for their fire fighters and for the general public on the subject of fire prevention and fire fighting. The setting up of communication links, via the telegraph and/or telephone was also a stated priority. The Metropolitan Fire Brigade came into being officially on 1 May 1891. At that time their Head Station was at 477 Little Bourke Street (Law Courts Place). This became Station Number 2 when Eastern Hill Station, which opened in 1893, became the new Headquarters of the MFB. Eastern Hill became the fire brigades No 1 station. All firemen passed through Eastern Hill Station if only for training. After 1893, the Fire Chief resided at Eastern Hill and the Deputy Chief lived at Station Number 2, Little Bourke Street. Due to the continuous nature of work, the fire stations were homes as well as workplaces for the firemen. This generated lifelong friendships for the men, a majority of whom were single. After 1950, forty hour shifts were introduced as part of work conditions and only officers continued to reside at the stations until the late 1960s. In 1893, the brigade opened No 3 Station at Bouverie Street, Carlton. 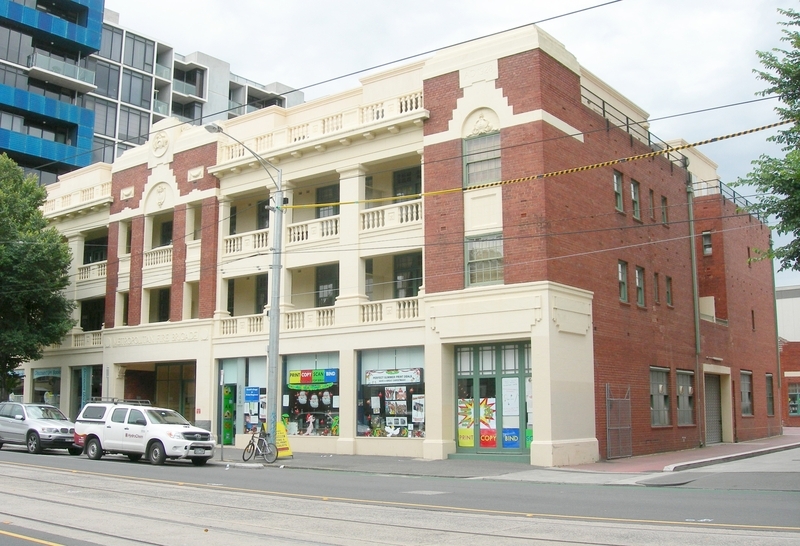 In 1929 this was converted to a special service and a new No 3 Station opened at 650-656 Swanston Street. The land was purchased by the MFB from The Bane Family on 7 December 1926. The new building was designed by Cedric Heise Ballantyne and a building permit was issued on 16 June 1928, to a value of £35,000. Cedric Heise Ballantyne (1895-1957) formed a partnership with Percy Oakden in 1900. In 1902 Ballantyne became the first Victorian-born associate of the Royal Institute of British Architects. In 1913, Oakden died, leaving Ballantyne the practice. In 1914 he became a member of the Royal Victorian Institute of Architects. Between 1920 and 1926 the firm was known as Oakden, Ballantyne and Hare. After 1926 it was called Cedric H Ballantyne and Associates. Hare was an engineer and the associates were B P Sutton and G H Sneddon, two senior draughtsmen. Between 1933 and 1939 the firm was called Ballantyne and Sneddon. After this Ballantyne operated alone from his farm at Trawool, near Seymour, keeping a small city office and taking on mainly Western District commissions. Melbourne and Metropolitan fire stations were some of Ballantyne?s earliest designs. At least 15 stations were designed for the MFB between 1893 and 1931. These were North Melbourne (1893): Preston (1898): Malvern (1906): Ivanhoe (1909): Hawthorn (1919): Abbotsford alterations (1916): Glenhuntly (1917): Coburg (1925): Sandringham (1926): Ascot Vale (1927): Sunshine (1928): Carlton (1929): Essendon (1930): Ringwood (1930) and Oakleigh (1931). Oakleigh was the last fire station to be designed by Ballantyne. In 1923 Ballantyne travelled in the Unites States of America and was influenced by the theatres he saw. On his return to Australia he designed a number of theatres such as the Lygon , East Brunswick (1924). Together with Oakden, Ballantyne designed the first Craftsman (Californian) Bungalows in Australia. He also designed buildings in Ballarat, Adelaide and Sydney. The design of fire stations was influenced by the need to accommodate both men and equipment in proximity as well as the necessary office space for communications equipment. Telegraph and telephonic communications were of the utmost importance in the speedy notice of fire and sufficient space was imperative for this equipment. Space for drying hoses and the storage of all vehicles and other equipment was of paramount importance and had to be allowed for in the design of fire stations. By the nature of the job, men spent long hours together at the stations and leisure time activities had to be addressed in the building layout. A recreation room was considered a necessity, not a luxury in the building design. At the Carlton Fire Station, these needs were addressed by the architect. Living quarters for sixteen married men and their families and for eight single men were provided on the two upper levels of the three storeyed building. The ground floor front incorporated leasable shop space and at the back was a two level block containing garages for four engines, office space and accomodation for single firemen. A recreation space was on the ground floor at the back of the apartment building. Laundry facilities were provided on the roof area of the apartments, where there was ample space for hanging washing. The 1929 Annual Report of The MFB stated that the staff were generally very satisfied in the new quarters.